Iron is a mineral that is extremely important and without enough iron, you may get iron deficiency anemia. 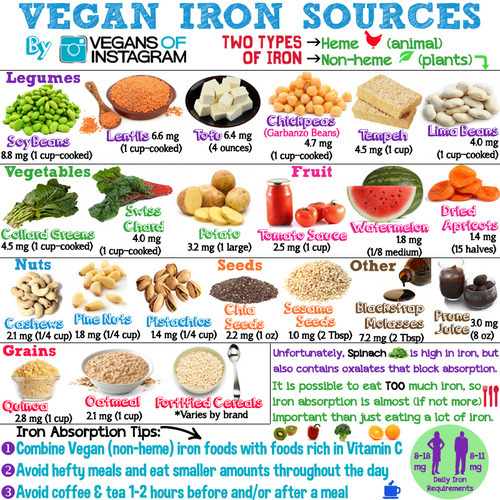 Iron is available in many different foods, yet, many people are still deficient. Iron is one of the nutrients that does not have a one-size-fits-all recommendation. At different ages and stages of your life, you need different amounts of iron including when you are breastfeeding, pregnant or once you reach a certain age. Iron is an essential part of hemoglobin which is a type of protein that transfers oxygen from the lungs to the tissues. In long-term care, which I work in, a low hemoglobin is extremely common. When most people come from the hospital, they have a low hemoglobin. Iron is also necessary for the formation of red blood cells, oxygen transport, energy metabolism and neurotransmitter activities. Iron is naturally occurring in some foods but is also often added to foods. There are two types of iron: heme and nonheme. Meat, seafood and poultry contain heme iron and plant-based foods and iron-fortified foods contain nonheme iron. The most common measures of iron stores are hemoglobin and hematocrit tests which you may not even know but they usually test these every time you get standard blood work. Hemoglobin concentrations lower than 13 g/dL in men and 12 g/dL in women show that you have iron deficiency anemia. Eating foods rich in vitamin C along with your iron-rich foods is a great idea since vitamin C helps with the absorption of iron. What if I need more iron? If you are eating iron rich foods and are still not getting enough iron, your doctor may recommend an iron supplement. I remember when my grandpa was ill, he was on an iron supplement to help meet his needs. Quite a few of my patients are on an iron supplement as well. When I was pregnant, I took a prenatal vitamin that contained iron. If your prenatal does not contain iron and you need additional iron, you may want to talk to your doctor about taking an iron supplement. Nature's Truth has a 65 mg iron supplement available. It comes in the form ferrous sulfate which is easier for your body to absorb than some other forms. You can purchase Nature's Truth products online and at CVS and Rite Aid stores.